Written by Stacy Sechrist on July 17, 2015 . Posted in News. 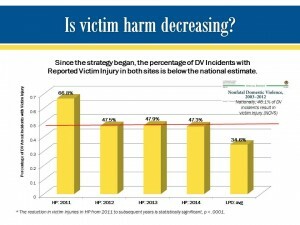 Stacy Se christ and John Weil of the North Carolina Network for Safe Communities presented their latest evaluation findings of the Offender Focused Domestic Violence Initiative (OFDVI) at the 2nd National Network for Safe Communities Practitioners Conference hosted at John Jay College in New Work, NY on June 25. 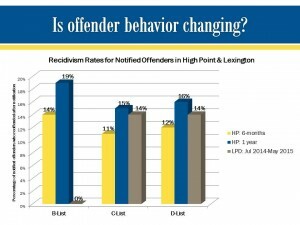 Specif ically, in High Point and Lexington, the reoffense rates for domestic violence offenders who have been notified range from 11-19% across notification categories. 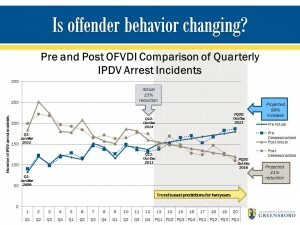 These rates are compared to estimates as high as 30-80% in the literature, with some literature suggesting that 60% of reoffenders will reoffend within 6 months of their initial domestic violence offense. 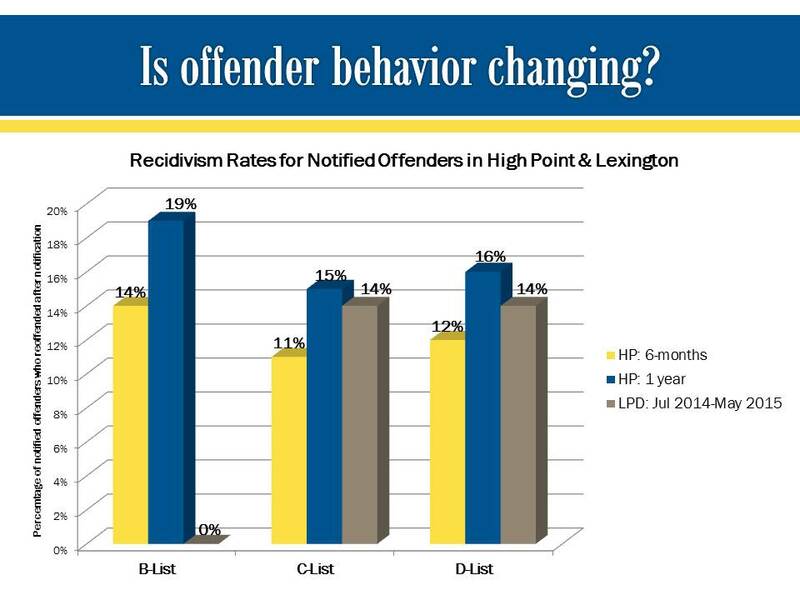 The 6-month and 1-year recidivism rates in High Point were presented for each of the offender notification categories and are depicted in the figure above. 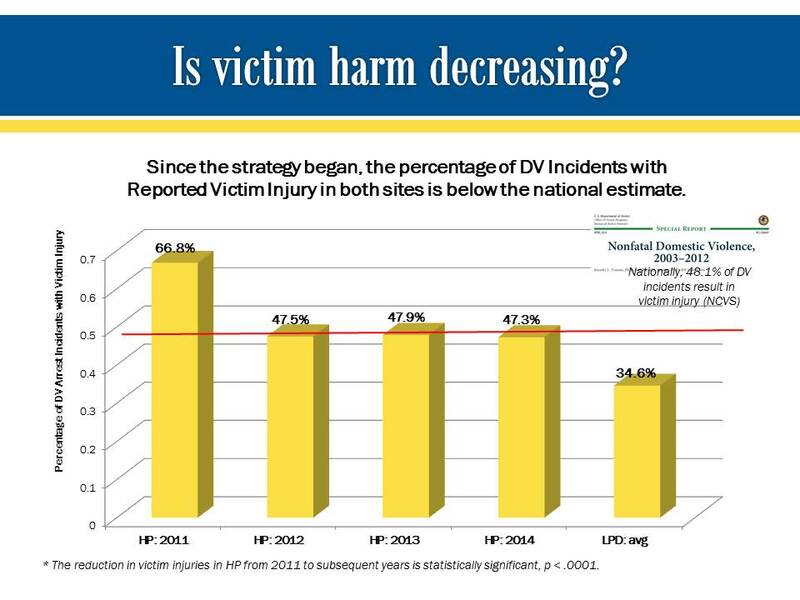 Also, in both High Point and Lexington the percentage of domestic violence arrests resulting in victim injury has decreased since the OFDVI strategy has been implemented and the rates of victim harm in both sites are below national estimates for incidents in which victim injury occurs. 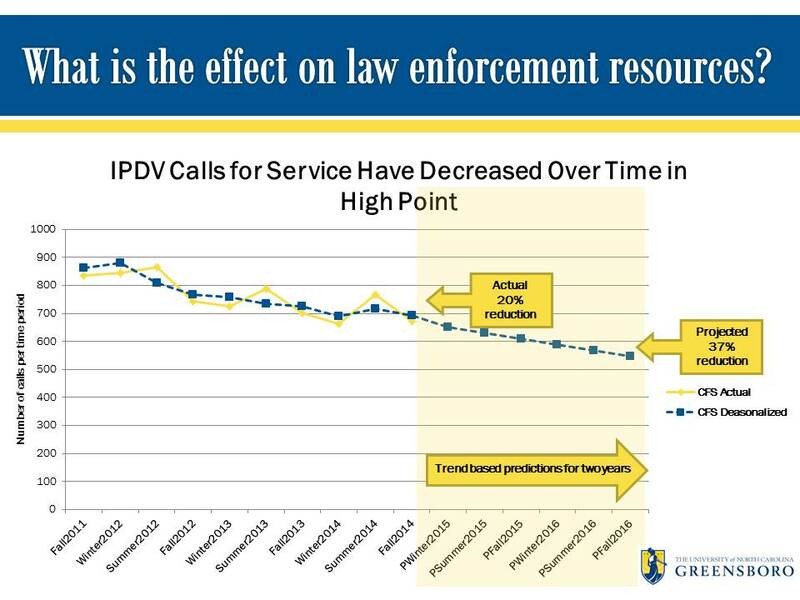 Finally, in High Point where longitudinal data are available, they have experienced a 20% reduction in intimate partner domestic violence calls for service in the three years since the strategy began and a projected 37% reduction in calls for service over the next two years. 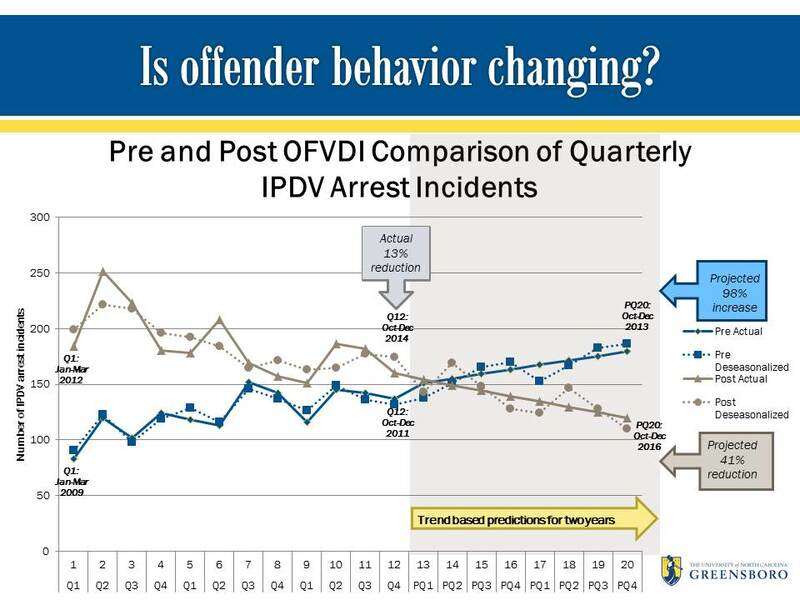 Also in High Point, they have experienced a 13% reduction in domestic violence arrests over the three years since the strategy began with a projected 41% reduction in arrests over the next two years. 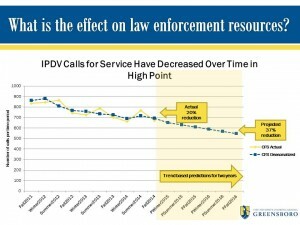 A final evaluation report of the OFDVI strategy as implemented in High Point (NC) and Lexington (NC) will due to the COPS office on August 31.